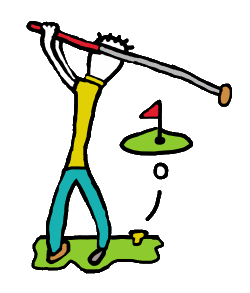 As we stand here at the first looking down the fairway it is time to tee off with a series of puns relating to the game of golf. Like most rounds it will consist of one or two excellent shots interspersed with a series of visits to the rough and beyond. Expect much hacking out and back onto the fairway until finally several hours later the round will be completed. Clubs smashed, caddie berated and back in the clubhouse for much-needed refreshment. Here are some golf jokes and puns for light relief. This page needs a lot more work. We are probably on the third tee at the moment. Rest assured we will keep hacking away until finally the round is completed. Sorry for any delays. Play on through.